You are in a maze. Only some paths will be free to travel; others will be blocked off by walls. You will have one of two goals: Either you have to get from one side of the maze to the other, or you have to clear it of every item that won't kill you. The computer will control other characters in the maze, who will kill you if they touch you. Sometimes they are set to fixed patterns; sometimes they move more or less randomly; sometimes they try to track you, probably with some degree of Artificial Stupidity. They will not be able to go through the walls, either. Not even if they are ghosts. They have a tendency to respawn in inconvenient locations in the games where eliminating all of them from the level isn't the objective. There will often be things in the maze that are special. Sometimes they are just extra points; sometimes they turn enemies into things that you can grab for extra points. If they move, they won't go through the walls either. 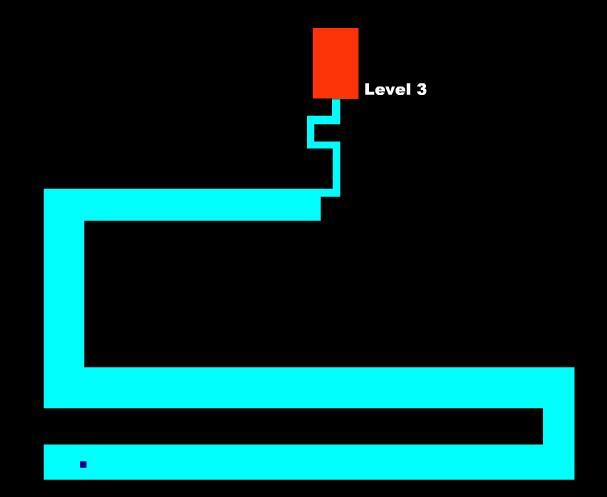 Maze games were most popular in the second and third generation consoles and home computers during that period. There were technical reasons too as maze games require relatively simple coding and don't require too much memory; many of them designed their mazes to fit on a single screen. After that, most commercial maze games were made in already established franchises. Differing from the stereotypical top-down maze game what could be called the Platform Maze Game. They superficially resemble Platform Games and are often mistaken for them, but there are major differences in how they play. The biggest difference is that platform maze games aren't about jumping; one can only ascend to a higher platform where the architecture allows, usually by taking ladders, and falling negates horizontal movement. Platform maze games also resemble maze games more in enemy placement and behavior, and generally have compact levels not designed for exploration. Several freeware flash games include "mouse maze game" subgenre where player has to guide a mouse from point A to B without touching the walls. Chip's Challenge. Some of the levels are this, others are Block Puzzles, some are both. There are a few which are neither, though. The Scary Maze Game, a.k.a. The Screamer Prank masquerading as a legitimate maze game, as shown in the image above. Snake — in which you become the maze you must travel through. TRON with its Light Cycles mission.